Wonder Woman's well-deserved awareness moves forward with the release of three new shirt designs. WW: Brushed Symbol, available on both a men's and women's black shirt, WW: Cloud featuring the art of Nicola Scott imprinted on a teal-colored shirt and last but not least, WW: Cube Symbol on a black shirt. 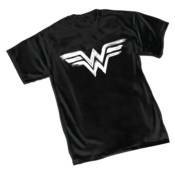 We've got the Wonder Woman shirts you're looking for. NOW AVAILABLE for sale in Canada and U.K.